The United States Mint opened orders for the always eagerly awaited American Eagle Gold Proof Coins. 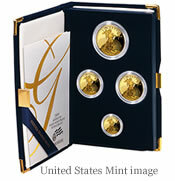 2008 marks the twenty-second year for the collector series of four 22-karat coins. Each of the four sized collector gold proof coins bear the "W" mintmark to indicate they were minted at West Point – the facility responsible for the entire family of American Eagle proof and uncirculated coins in gold, silver, and platinum. The coin bears the distinctive designs of Augustus Saint-Gaudens‘ rendition of Liberty, recognized as one of the world’s most beautiful designs, and sculptor Miley Busiek’s equally majestic golden eagle scene meant to symbolize family tradition and unity. The obverse or heads side of the proof coin shows Liberty with flowing hair and holding a torch in one hand and an olive branch in the other. The reverse or tails side of the coin has an image of a male eagle carrying an olive branch and flying above a nest with a female eagle and her hatchlings. Each coin comes within an attractive blue velvet, satin-lined presentation case and a Certificate of Authenticity signed by the current Director of the United States Mint, Edmund C. Moy. As is traditional, the proof coins have production limits in place. The one-ounce, half-ounce, quarter-ounce and tenth-ounce coins may be purchased separately or together in a four-coin set. The price of collector proof coins will always exceed their bullion value. However, new bullion coin prices can move up or down based on their content. In fact, the U.S. Mint has suspended bullion coin sales several times to readjust their prices due to changing gold and platinum prices. The End of 2008 American Eagle Silver Proof Coins? Why not 24 Karrot Gold Eagle since Gold Buffalo is 24 karrot? We have Platinum Eagle so why not Palladium Eagle Coin? thats alot of money for a coin!!!!!!!!!! They are discontinuing some of the collector coins and these sound like collector only coins. Palladium would be more than silver and less than gold though.